Hooray for more Doctor Who stuff from Humble Bundle! Right now, they’re offering a selection of over 20 graphic novels from Titan, mostly featuring 9, 10, 11, and 12–we actually get the first several volumes of each of these sets. But there are also some other doctors featured, including a Humble Exclusive featuring the First Doctor. 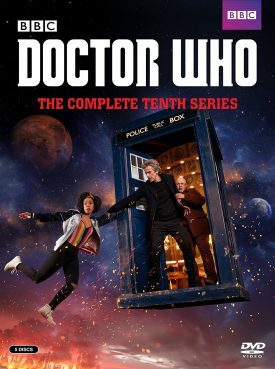 It looks like a well-rounded and enjoyable selection for anyone who like Doctor Who and would like to give the graphic novels a try. You can find out more here. Calling all Whovians! Right now, Humble Bundle is offering a collection of Torchwood and Doctor Who audiobooks/audio dramas which looks pretty fantastic. The Doctor Who ones include four collections of shorts as well as two full-length stories. Torchwood is all full stories–eight of them! Additionally, there are two interviews, including one with Tom Baker. I’m not sure about the Doctor Who ones, but the Torchwood stories at least appear to be full audio dramas, which I’m very excited about. Because this cast does a great job in this medium (see my review of Torchwood: The Lost Files). Plus, it looks like these are all new stories, not ones included in The Lost Files. So yeah, I’m excited for this bundle if only for that. What on this strange Earth does Quill know about children?! She’s a freedom fighter from an alien planet, bound by a nasty little creature in her head to serve and protect the princeling of her sworn enemies. Yet somehow, following the destruction of their planet and both of their peoples, she finds herself on Earth, responsible not just for the prince but trying to manage four other teenagers as well. It might not be so bad if she were just dealing with the series of alien threats that seem drawn to Coal Hill Academy and to these five kids. But throw teenage angst, romance, and moral development into the mix, and Quill is definitely over her head. Having watched BBC’s Class, I am blown away by the fact that it hasn’t received more love and attention; it’s incredible. It’s written by Patrick Ness for crying out loud! I just don’t understand. I wouldn’t have even heard of it if not for the (welcome) post of a fellow blogger. And can I just say how crushed I am that this story will not be continued beyond the first season?! Especially since it leaves us with a cliffhanger ending of killer proportions?! Still, this show is well worth the watching, despite the inconclusive conclusion. It tends to a more YA audience, with some definitely darker (and gorier) themes and a willingness to face moral ambiguity and tough choices head-on that I found impressive. I love that Ness wrote the whole series rather than handing off episodes to other writers; because of this there’s a consistency in the story and the characters that just shines. The basic premise is that Miss Quill (and alien disguised as a physics teacher), Charlie (an alien prince disguised as a student), and April, Ram, Matteusz, and Tanya (human students) are all at Coal Hill Academy, and due to their exposure to space/time inconsistencies, they are ready targets for anything alien that comes through the cracks in space/time surrounding the school. Basically, you’ve got the Scooby Gang at a school on top of a Hellmouth (sound familiar? ), only aliens rather than the supernatural. This definitely makes for some exciting episodes, but that is so not what makes this TV show so incredible. The depth and complexity of the characters’ personalities, the development of them over the course of the show, the way their relationships grow, the fact that there are real friendships developed as well as romances, the tough choices they have to make, and the acting that brings all of that to light–that is what I absolutely loved. And yeah, this show is basically a poster child for the whole diversity thing; you’ve got a gay couple, POC, a Sikh family, etc. But the great thing is that these aspects of the characters are so naturally a part of who they are, as opposed to something that feels forced. And there are tons of other aspects of their characters that are just as much developed and a part of the storyline. Another thing I loved is that the kids actually have families that are involved in their lives and are supportive of them; how cool is that? Also, Quill’s character is angsty and totally badass in an awesome way; I love her and how totally not the nurturing sort of teacher she is . . . yet how she gets totally shoved into the role and works with it. So yeah, Class is an awesome show that I would definitely recommend, especially to those who enjoy Ness’s writing or contemporary YA. And yes, I’m definitely going to be tracking down lots of fanfic to fill the hole left in my heart by this series not being continued.